It was Aug. 14, 2017, just one week before the Moon would cross paths with the Sun and Earth, casting its shadow across the United States. The entire country buzzed with anticipation for the fleeting chance to see the corona, the Sun's tenuous outer atmosphere. But the wait was uniquely nerve-wracking for a group of scientists at Predictive Science Inc., a private research company in San Diego: They had just published a prediction of what the corona would look like on Aug. 21, the day of the total solar eclipse. How would their prediction — the result of a complex numerical model and tens of hours of computing — compare to the real thing? "Waiting for totality, you know exactly what you've predicted and what you're expecting," Predictive Science researcher Zoran Miki? said. "Because you work with the model so much and see the prediction so many times, it's burned into your brain. There's a lot of anxiety because if you're totally wrong, it's a bit embarrassing." The Predictive Science researchers used data from NASA's Solar Dynamics Observatory, or SDO, to develop a model that simulates the corona. Their model uses measurements of magnetic fields on the Sun's surface to predict how the magnetic field shapes the corona. Their work was supported by NASA, the National Science Foundation and the Air Force Office of Scientific Research. Miki? is the lead author of a paper summarizing their work and published in Nature Astronomy on Aug. 27, 2018. 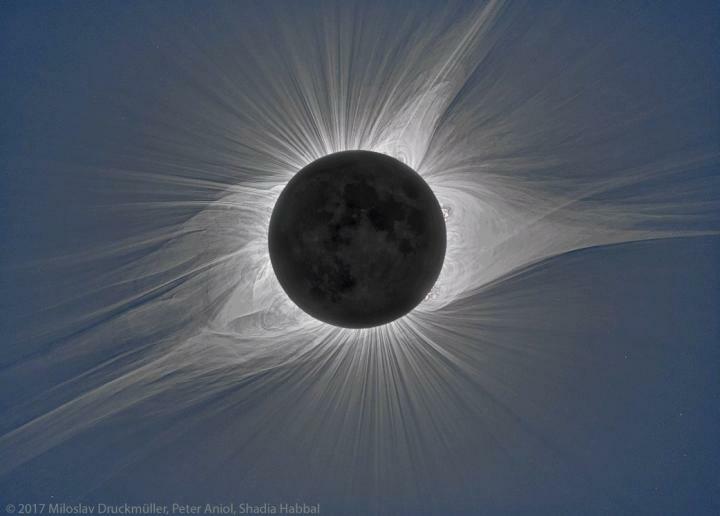 Coronal science is deeply rooted in the history of total eclipses; even with state-of-the-art technology, it's only during a total eclipse that scientists can resolve the lowest region of the corona, just above the Sun's surface. This dynamic part of the solar atmosphere is threaded with complex magnetic fields that supply the energy for tremendous eruptions like flares and coronal mass ejections. The ability to forecast and predict space weather — much like we do terrestrial weather — is critical to mitigating these impacts, and models such as Predictive Science's are key tools in the effort. Eclipses offer a unique opportunity for researchers to test their models. By comparing the model's corona prediction to observations during the eclipse itself, they could assess and improve the performance of their models. Greater complexity demands more computing hours, and each simulation required thousands of processers and took about two days of real time to complete. The research group ran their model on several supercomputers including facilities at the University of Texas at Austin's Texas Advanced Computer Center; the San Diego Supercomputer Center at the University of California San Diego; and the Pleiades supercomputer at the NASA Advanced Supercomputing facility at NASA's Ames Research Center in Silicon Valley, California. In addition to SDO's maps of the Sun's magnetic field, the model used SDO observations of prominences — snakelike structures made of cool, dense solar material that protrude from the Sun's surface. Prominences form in stressed parts of the magnetic field, where it's twisted into a rope and capable of erupting if overwound. The researchers also included new calculations for coronal heating. We don't yet understand how the corona blazes upwards of 2 million degrees Fahrenheit, while just 1,000 miles below, the underlying surface simmers at a balmy 10,000 F. One theory proposes electromagnetic waves — called Alfvén waves — launched from the Sun's churning surface rush out into the corona, heating particles as they propagate outwards, a bit like how ocean waves push and accelerate surfers toward the shore. By accounting for prominences and these tiny — but numerous — waves, the scientists hoped to paint an increasingly detailed portrait of the corona's complex behavior. After the eclipse, the group found their prediction bore a striking resemblance to the Aug. 21, 2017, corona, although the model lacks many finer structures. Both the prediction and photos from the ground taken on the day of the eclipse show three helmet streamers — immense, petal-shaped structures that form over a network of magnetic loops. The strength of the comparison supports advances in the new model. Scientists have always known the twisted magnetic fields underlying prominences are an important part of the Sun, but the team's earlier models weren't sophisticated enough to reflect it. The same is true for the waves heating the corona. "In some sense, the model's performance tells us the new heating model is headed in the right direction," Miki? said. "It's certainly showing improved results. We should pursue and refine it further." The scientists fed their model with magnetic field data collected from the Sun's Earth-facing side over the preceding 27 days — the time it takes the Sun to complete one full rotation — since they currently don't have a way to observe the entire spherical solar surface all at once. With that approach, measurements taken at the beginning of the 27-day period — from parts of the Sun's surface that have subsequently rotated toward the back where they can no longer be seen — are more likely to grow outdated than those taken at the end. But in times of diminished solar activity, the magnetic field isn't quick to change, so even 27-day-old data is useful. One discrepancy between the prediction and the observations is a skinnier feature, called a pseudostreamer, that jets out from the Sun's upper-right. The researchers determined their model missed the pseudostreamer because the magnetic field changed in that specific region during the data collection. A different model's prediction successfully captured this pseudostreamer, Miki? said, because it appears to have estimated the magnetic field more accurately there. "The biggest thing I take away from this is they've got a sophisticated model that looks good, but they're limited by their observations," said Alex Young, a solar scientist at NASA's Goddard Space Flight Center in Greenbelt, Maryland, who wasn't involved with the study. "What the model misses is a matter of the Sun changing, and that's something they can't handle without enough observations from the right places." Testing a model like this so thoroughly supports the idea that, with more data and diverse vantage points, scientists can better calculate the Sun's finer dynamics — and ultimately improve their ability to forecast space weather events that can interfere with technology and astronauts in space. Just under a year after millions glimpsed the corona themselves during the total eclipse, on Aug. 12, 2018, NASA launched Parker Solar Probe on its way to actually fly through the corona, going closer to the Sun than any spacecraft before. Parker Solar Probe will send back to Earth observations from inside the corona itself, which researchers can add to their models, filling crucial knowledge gaps in the corona's complicated physics. Miki? said models like theirs can complement the mission by contextualizing the spacecraft's journey through the corona. Scientists have never worked with data collected so close to the Sun. By modeling the entire corona — the bigger picture — researchers will provide crucial perspective on Parker's surroundings as it ventures into entirely unexplored territory. "This is amazing science for Parker Solar Probe and from the eclipse, that shares one key purpose," said Thomas Zurbuchen, associate administrator at NASA Headquarters in Washington. "Beyond the science, this is about really advancing our understanding of and ability to predict space weather, a major impact we can have at NASA."